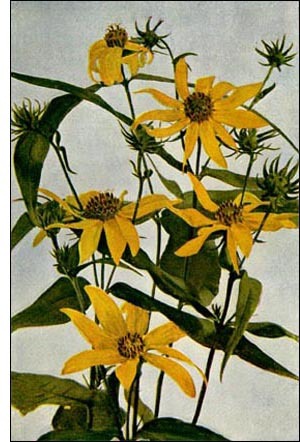 The Sunflowers are mostly large, erect, perennial herbs, with the flowers characteristic of the order Compositae. They are natives of tropical America, but have become widely distributed in cultivation, appreciated on account of their large yellow flowers. They not only thrive very luxuriantly under cultivation, but spread very quickly spontaneously. Every one is familiar with the sunflower as it appears in cultivation; hence no special description shall be given of it. It is kin to the iron weed, the dandelion, the goldenrods, the asters, and the daisies. It would be impracticable to describe or mention all the species and varieties of sunflowers and their numerous relatives. Helianthus annuus is a commonly cultivated species. The seeds of this plant furnish a very useful oil; the flowers yield honey and a useful dye; the stalks, a textile fabric, and the leaves, fodder. The seeds of this and other species are also used as food, and as a surrogate for coffee. The carefully dried and prepared leaves have long been used as a substitute for tobacco in cigars. Poultry eat the seeds very greedily and thrive well upon them, due to the oil present. It is also maintained that a large number of sunflowers about a dwelling place will serve as a protection against malaria. An infusion of the stem is said to be anti-malarial.